One of the things I promised myself when I quit my full-time job was that I'd invest more time into self-care. I mean, really, I quit the job because it was making me sick. It's only right that I give back to myself. Find some inner peace and improve my health if we're going to sacrifice the income and benefits associated with that employment. As such, I've been much more attentive to myself. My needs. My strengths and struggles. I am a person who thrives on being busy. Part of that compulsion is a way to stave off depression. I've known for years that staying busy is the best way for me to avoid the desire to pull the covers over my head and disappear. I've also started to note the tipping point in that arrangement. Having SO many things going on has shown me the flip side of happy-busy, and it's information overload. A while back I did Note to Self's #Infomagical challenge--which is still available with one clickety click--and I chose to focus on being more creative. I streamlined a lot of my digital life during that challenge but also earlier in the year when I started reading up on Getting Things Done productivity methods. I don't stumble into information overload territory as much as I did when I was working my PR job, but it happens occasionally, and just yesterday was a perfect example. It was rainy and dreary outside. I couldn't go walk-run as much as I usually do. I was stuck indoors. I figured I might as well do some blog planning, so I got a list of topics squared away, worked on drafting, Tweeted for awhile, got some Instagram ideas together, and generally did stuff that needs doing. And then I wanted to rip someone...anyone's...head off. Thinking ahead was like looking down a tunnel. Even when I was done with my planning, I checked social media obsessively. No, Andi, there are no new messages in the three seconds since you last checked Twitter. 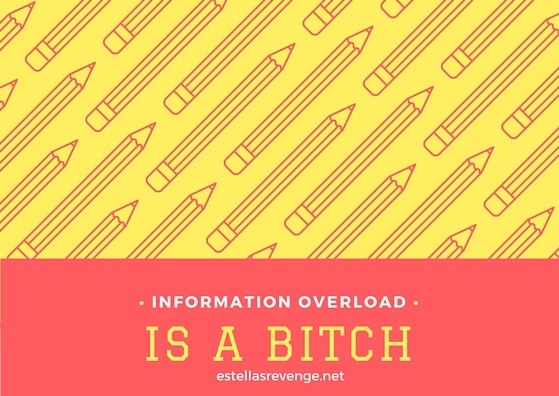 That's what information overload, and being completely overwhelmed, feels like for me. Like my brain is on fire and I'm stuck in an endless loop of checking, rechecking, and obsessively looking. All the while feeling too overwhelmed to move on to the next obvious task on my to-do list. In this case, I really could've used that next block of time to work on a Book Riot post or a reference letter that's hanging out there unfinished. Information overload is like a hamster wheel for me....spinning, spinning but not going anywhere. I realized in that moment, that I had to do something else. Anything else. Reboot. I did a 10-minute guided meditation, bitched on Twitter (counterproductive), relaxed for a bit away from the computer and my phone. I got up and tidied our medicine corner of the kitchen (a place where we pile up antacids, pain relievers, and other frequent flyer meds that quickly gets cluttered). Then I was able to sit down and think about what to do next. We have so much information at our disposal...so many ways to engage with it, create it, disseminate it. It really is overwhelming sometimes, and there's nothing worse for me than that brain-on-fire feeling of being stuck in the information loop. Exercise has certainly shown itself to be it's own kind of meditation practice before the day gets going, but with a week of rainy weather ahead I need to plumb the depths for more. How do you quite your brain when you're feeling overloaded? Honestly, when I start to feel like that the best thing for me to do is to go offline. Sometimes I cook. Sometimes I clean. Sometimes I exercise (yoga videos actually do a decent job if I can't walk or run). Sometimes I binge watch Netflix on a tablet and make a jigsaw puzzle at the same time. But overall I find just unplugging pretty helpful. I would like to say that going offline is a thing I do when I know I should, but it's not. I might be textbook addicted. Oof. I hear this. I work from home, and I have those days (like today) where I just cannot seem to stop clicking, where I have fifteen tabs open and then close them all and then start all over again. It feels like a weird compulsion, especially when I am telling myself the whole time to STOP and FOCUS on something else. Some days I make a bargain with myself to not open the browser (unless I need to do so for work) until I have done x,y,and z. Sometimes stepping away and doing a chore or reading a physical book helps. It's nice to know I'm not alone, though! When this starts to happen for me I find myself doing a couple things - either I clean/organize my house, read, drink wine (lol), run on the treadmill or walk. Basically anything to preoccupy my mind and relieve the stress! Drinking wine, ftw! Since I've started moving more, I do take the opportunity to walk around the block a few times. I enjoy being outside so much more than I ever realized, so that definitely helps. I have trouble quitting the overload, especially when I go to bed. It's a vicious cycle. Yessss! Me too. I need to NEVER pick up the phone in bed to peruse anything. I have discovered that jigsaw puzzles can be a great escape for me. I turn off the internet and put on some music and it turns out to be very meditative. Ooooh, that's a fun idea. I think David likes puzzles, and I know G would get in the middle of everything. Might have to try that. I try to stay off the computer after dinner. Not always successful, but it does help. I've always tried to stay off roughly after 5:00. That's when Greyson gets home, so evenings are about quality time with him and reading. Another wonderful post. I need to work on quieting my brain. I did so much social media during BEA and I'm thinking about taking a break. I'm very all-or-nothing. No middle ground, apparently. But good luck with quieting things when needed! You've got this. I had to come back to this post today because just this morning the Starbucks app introduced me to the 5 Minute Journal app, which I can totally see helping me get focused and reflective and put aside the ~noise~ of everyday life. It might be worth checking out for you, too! It's a cycle! Judging from the comments, we're all feeling it but likely not saying anything. I have a habit of just forgetting about the net for days... but this doesn't help my brand (more my photography business) because suddenly I'm not relevant because NO NEW CONTENT. I actually just let my photo IG handle die because I just couldn't face the responsibility. I honestly don't know how people like Elsie and Emma (as an example) from A Beautiful Mess do it, 24/7. I'd lose it. Anyway, I've gotten too far off track. I absolutely use exercise as a way to refresh (just have to be mindful not to pull my phone out to check stuff when walking). Glad you're finding some refuge in that as well. I definitely do the obsessive checking. Sometimes I just have too little planning done in my life and it leads to me forgetting the things that I need/want to do. I need to find the balance between overplanning and stressing myself out and underplanning and giving in to the absorption of a bunch of useless information. I think the trend for bullet journaling is too much for me but a little to-do list in a note on my phone might be just right. I kept one running while planning Z's birthday party over the last couple of weeks and it was perfect. Oh so easy to get sucked down the rabbit hole! Like you, I keep busy. I have to...my kids are older and don't need me as much or like to do things that are more solitary, like play video games, read, hang with friends. So when I'm not with them, I'm heading out to my friends and their little ones, going somewhere, doing something. But it got to the point where when I had a night or hours alone I would feel very lonely. It was too much and I knew in the past month that I needed to find a balance so when things weren't busy, it wouldn't be a shock to my system. One thing is, I've been "off" of FB for a week now and plan on going longer. I didn't go on at all for a few days. Then I logged back on just to post my blog posts and use Messenger. I dropped out of groups I no longer really wanted to be a part of and unfollowed people who were just bringing me down with their posting. And I said happy birthday to a friend and posted Prom pics. But I have not scrolled the newsfeed for an entire week! It feels great too. I've actually gotten some reading done, spent more times with my kids, and felt a little more free. The other social media sites don't cause me any trouble like FB does. I hit that app every time I pick up my phone and waste so much time. I'm hoping to make this somewhat permanent...that I will look through here and there, but because I'm not posting to it a lot, notifications aren't going to draw my attention to the app. It will become more useful for communication purposes. The best moments in life become more so when I'm not running to document them.